Cisco Systems, Inc. has had trouble growing revenue recently, and its stock has already run up 20% this year. But it's still a value, and here's why. Cisco Systems (NASDAQ:CSCO), the leading provider of the switches and routers that form the backbone of the Internet, has been muddling through a difficult environment over the past year. Weak demand in some areas of its business has caused both revenue and profits to decline, and the stock, while rising over the past year, has been fluctuating around the same level for the past decade. Despite the challenges that Cisco currently faces, the stock remains one of the better values available in the technology sector. With a strong balance sheet, dominant market shares in its key businesses, and the potential for steady growth, Cisco's current valuation offers an opportunity for investors. Cisco recorded $47.1 billion in revenue in fiscal 2014 (which ended in July), with $36 billion coming from selling products and the rest coming from delivering services. On the product side, Cisco's core business of switching and routing accounted for a total of 60% of product revenue, and the company is the market leader in both categories. Switches connect computers together to form networks, and routers connect those networks together over the Internet. Cisco controls about 64% of the switching market and 45% of the routing market. Cisco is the market leader in most of its other businesses as well, including telepresence, wireless LAN, Web conferencing, and storage area networks, and it has grown to be the second largest vendor of x86 blade servers, up from a negligible market share five years ago. This dominance has allowed Cisco to reap enormous profits over the years. In fiscal 2014, Cisco managed a gross margin of 58.9% and an operating margin of 19.8%, booking $9.3 billion in operating profit and free cash flow in excess of $11 billion. The biggest threat to Cisco's business is the rise of software-defined networking. SDN allows software and cheap hardware to replace the proprietary, expensive hardware that Cisco sells, and while it's still far from being mainstream, it could potentially threaten Cisco's bottom line. Cisco has embraced SDN with its own line of products that incorporate its own version of the technology, and recently CEO John Chambers declared that Cisco was pulling away from smaller SDN start-ups, and had effectively won the battle. Whether that ends up being true or not, so far SDN has had no real negative effects on Cisco's business. Cisco stock is up nearly 20% so far this year, but it still offers considerable value. Let's start by looking at the balance sheet. At the end of the most recent quarter, Cisco had $52.1 billion in cash and $21 billion in debt, leaving a net cash position of $31.1 billion. Cisco's market capitalization is currently about $140 billion, and this excess cash represents about 22% of that value. 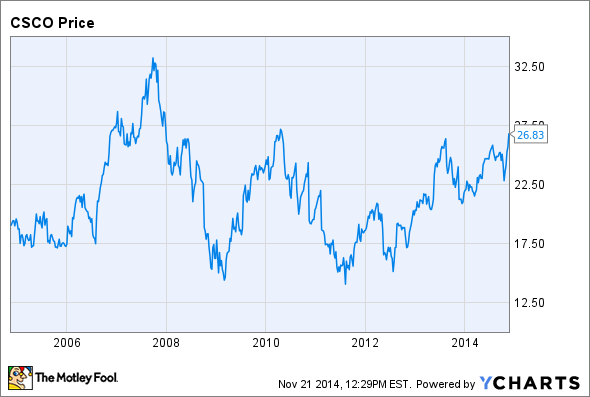 The market, then, is valuing Cisco's earnings power at about $109 billion. Cisco's earnings declined substantially in fiscal 2014. Net income fell to $7.85 billion, down from $9.98 billion in fiscal 2013. But this decline was partially the result of some one-time items, and these should be added back to get a more realistic view of Cisco's real earnings power. Cisco reported non-GAAP net income, which adds back in a variety of items, of $10.86 billion in 2014. This is essentially flat compared with 2013, and it paints a very different picture of the company's earnings. Cisco's non-GAAP net income calculation adds back share-based compensation, which I view as a real cost, since it dilutes existing shareholders, so for valuation purposes I like to remove it. Doing this, Cisco's adjusted net income comes out to about $9.5 billion. After backing out the net cash, this puts Cisco's adjusted P/E ratio at 11.5. For a company that dominates its core businesses, protected by huge switching costs, this valuation seems awfully low. Analysts expect Cisco to continue to grow its earnings, with the average estimate putting Cisco's annual earnings growth over the next five years at 7.6%. How much is Cisco worth? There's no exact answer to that question, but an adjusted P/E ratio of around 15 seems more reasonable for a company with Cisco's competitive advantages. The S&P 500 has had an average P/E ratio of about 15 historically, and it's currently much higher at around 20. At an adjusted P/E ratio of 15, Cisco would be worth about $174 billion, or $33.75 per share. That's 25% higher than the current share price, and this discrepancy creates an opportunity for value investors. Cisco also pays a solid dividend, yielding about 2.8%, and the company has plenty of room for dividend growth going forward. Even after a big run this year, Cisco stock remains a solid value.